The Historic homes and neighborhoods of Indianapolis offer a glimpse of life in a simpler time. Our most notable historic homes include the Morris Butler House, James Whitcomb Riley's home, which is now a museum and the home of President Benjamin Harrison. As the city grew, new neighborhoods were established. The Queen Anne and Victorian era of homes gave way to American Four Square and Craftsman design, featuring larger living space. Along the streets of our Historic neighborhoods are beautiful Tudors and Cottage style homes , some Italianate and Shingle Style homes. In the mid-1900's, many of these beautiful downtown homes were left in shambles and disrepair. Through hard work, a labor of love and resurgence of interest in living downtown, these historic neighborhoods once again reflect the beauty and prominence of the age in which they were built. There are different classifications for homes on The Historic Register. Some of these neighborhoods are true Historic Districts, some are in Conservation Districts. Others I've included because they simply represent some of the beautiful neighborhoods of the era. 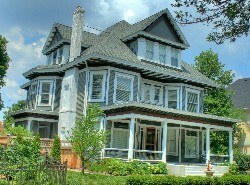 Follow Paula's board Historic Indianapolis Neighborhoods on Pinterest. Historic Preservation at IndyGov.com - Be sure to check out the before and after pictures of homes in revitalized historic districts. Tiffany Benedict Berkson expounds on the history and neighborhoods of Indianapolis on her blog, simply named, Historic indianapolis.